What Kind Of Cavity Risk Do You Face? Home | Preventive Dentistry | What Kind Of Cavity Risk Do You Face? 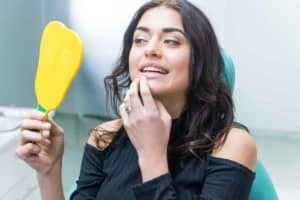 If you are not experiencing active pain or sensitivity in your tooth, it is safe to assume everything is fine with your oral health…or is it? A cavity will first form at your enamel, and you may not realize when this takes place. So how do you make sure your teeth are staying healthy between preventive dental visits? Your daily oral care can have a real impact on your cavity risk. This regimen should include both brushing and flossing, to fully clean your teeth. You should also be paying attention to your diet, and keeping your sugar intake limited. Your oral care should go beyond brushing. One thing you should definitely include is flossing. Flossing will protect areas of teeth that are harder to reach, and increase your defense against cavities, and against gum disease. You should also think about how your diet is affecting your cavity risk. A nutritious diet that limits sugar will help protect your smile. It should be noted that sugar is not the only concern you face. Alcohol can dehydrate you, which hurts your natural cavity defense. You should also watch out for acidic products, which can soften your enamel. One reason regular preventive dental care matters is that your dentist can catch problems early, leading to less involved treatment. This means you will only need a dental filling, and can avoid having a problem develop until a root canal is needed. If you feel something may be wrong in between these appointments, reach out to your dentist. That way, you can limit the severity of a developing problem, and avoid oral health complications. At Wager-Evans Dental, you can look forward to expert cavity care whenever you need it. Of course, with regular dental appointments, and smart oral care practices at home, you can make a notable reduction in your overall risk for problems. Located in Reno, NV, we are proud to welcome residents from South Meadows, Double Diamond, Caughlin Ranch, Donner Springs, Meadowood, Sommersett, Arrow Creek, and all surrounding areas. To schedule a consultation or your next dental appointment, you can visit our office, or contact us today by calling (775) 829-7700.